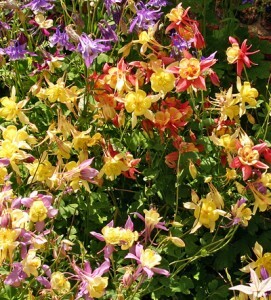 Columbines are generally low-maintenance (if short-lived) plants with few problems in home gardens. 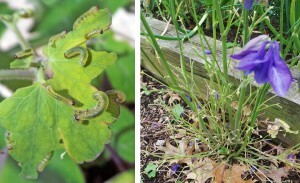 But there are two types of insect pests that can be locally common that cause conspicuous damage to the plants, especially on hybrid columbines (Aquilegia × hybrida): columbine leafminers and columbine sawfly. Fortunately the damage usually only affects the plant’s appearance and generally doesn’t impact the plant’s health or survival. 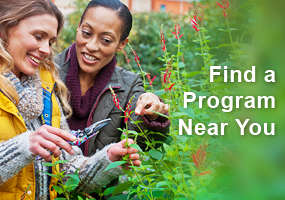 If either of these pests become too problematic, a better choice is to replace them with the native Aquilegia canadensis that is not affected nearly as much. 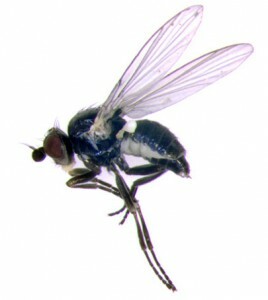 Adult fly of Phytomyza aquilegivora. 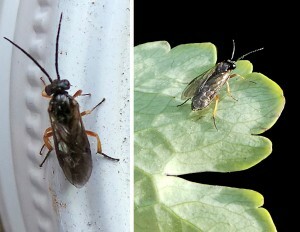 Columbine leafminers are small, dark colored flies native to North America that gardeners rarely notice. The species Phytomyza aquilegivora is the most common one that commonly occurs in the Midwest, making distinctive serpentine trails in the leaves. 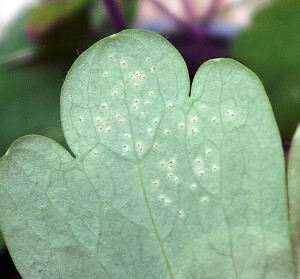 P. aquilegiana, which produces blotch mines, occurs in eastern North America, and P. columbinae is a western species that creates linear mines. The female fly lays its eggs singly on the leaves in spring about the same time the plants are starting to flower. The larvae (maggots) then tunnel into the leaf, feeding on the tissue between the upper and lower leaf surfaces. the small white maggots (R). As they eat their way through the tissue, they produce meandering tunnels that grow wider as the insects develop. This feeding shows as a squiggly white line or trail (or blotch) on the outside of the leaf. There can be more than one larva per leaf. blotch mines of P. aquilegiana (R). Once the larva has completed its development it tunnels out of the leaf and cuts a crescent shaped hole in the leaf to pupate hanging on the underside of the leaf in a small yellowish to dark brown, shiny puparium. After a few weeks another generation of adults emerge. There can be up to 3 generations per year, with the last generation of maggots dropping to the ground, to burrow in and overwinter in the soil as pupae. hole to emerge (C) to pupate in a dark brown puparium (R). Because the damage is usually only cosmetic, chemical controls are generally not recommended. Unless the infestation is really heavy, the mines can be ignored, or the affected leaves can be picked off and destroyed (as early as possible, before the larvae pupate, to reduce the population in the next generation). There are also many hymenopteran parasitoids that will kill columbine leafminers, although they will not prevent leaf damage, since the parasitized larvae still mine the leaves before they are killed. If insecticides need to be used, treatments should be applied when the adults first appear. The adult flies make punctures in the foliage with their ovipositors in order to drink plant fluids, and these small marks are a good indication of the activity of these insects; insecticide applications should be made as soon as they appear to kill both the adults and the newly hatched larvae (but these materials likely will kill beneficial insects, too). Once the maggots are inside the leaf insecticidal sprays will not be able to reach them. *Not to be confused with the small gooseberry sawfly (Pristiphora appendiculata), formerly mistakenly known as P. rufipes. This other species only feeds on Ribes spp. and has multiple generations per year. The columbine sawfly, Pristiphora rufipes*, is an insect related to ants, wasps and bees (Hymenoptera) with a larval stage that looks like a caterpillar (larvae of Lepidoptera). This European species was first discovered in North America in Ottawa, Canada in 1963. It was found in New York in 1985 and has since spread west to Minnesota. The adult is a typical-looking sawfly – like a wasp with no waist – about ¼ inch long. It is mostly black with some whitish markings on the head and pale orange legs. The females lay eggs on the leaves in late spring, and the green larvae with dark heads begin feeding on the leaf edges. They eat inward, eventually consuming everything but the midvein as they grow up to about ½ inch long. When they mature after a few weeks, the larvae drop off the leaves to pupate in brown, oblong cocoons amid leaf litter. There is only one generation a year in the upper Midwest. amid pea gravel (RC) and a single brown cocoon (R). The larvae are only active in late spring, usually from April to June. If numerous, they can devour all the leaves, leaving only the stripped stems and flowers. Severe infestations can kill a plant, but this is rare. Their feeding damage is primarily cosmetic and even columbines that are completely defoliated will recover. Unless stressed by other factors, within a few weeks it will put out another flush of leaves. These sawflies are small and the same color as the leaves, and often feed on the underside of the leaves during the day, so they are easy to miss until defoliation is severe. 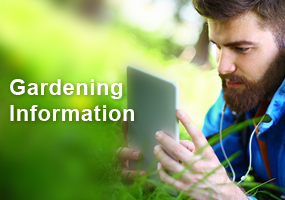 Plants should be inspected frequently in spring, especially where these insects have occurred in the past, so that they can be controlled as soon as possible to prevent extensive plant damage. 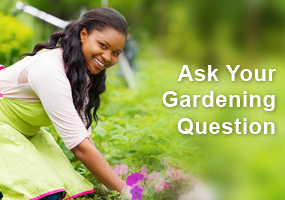 They are easy to pick or knock off the plants into a container soapy water. If physical removal isn’t practical, insecticidal soap will kill the small larvae (but the spray must cover them) without affecting other animals, but BT will not, as it only kills true caterpillars. Because birds eat or feed sawflies to their young, other types of pesticides with residual activity should be used only as a last resort for severe infestations. If most of the leaves are already gone, cut the plant down to the ground and destroy the remnants. Columbine sawflies are the same color as the leaves (L and LC), often feed on the underside of the leaves (RC), and are fairly small (R) so are easy to overlook. There are many species of sawflies, with most able to feed only on one type of plant. Other plants commonly attacked by sawflies include roses, pines and mountain ash, but the sawfly species that attack those plants are not the same as the one that feeds on columbine. I am so glad I found this site! I bought Columbines for my garden last summer and they were beautiful. I did have a problem with slugs mid-summer eating the blooms off of everything. This year, no slugs, but I noticed my Columbine was starting to get buds but (it seemed like overnight!) Almost all the leaves were gone! Just the stem was left. I thought “oh no! The slugs are back!” I just went outside to see if I could catch them in the act and low and behold there were little green worms all over the few straggly leaves that are left. I plucked them off and threw them in the pond as a treat for the fish! I’m so glad to know that the plant will survive and sprout new leaves. Next year I’ll know what to look for and when. Thanks so much!!!! I’ve had ongoing problems for a few years with columbine sawfly in two gardens I maintain in Minnesota, and they can be multigenerational contrary to the information provided here. It the most severe sawfly summer two years ago, I had defoliation of my columbines by sawflies from May into August. I just started seeing the white trails on columbine leaves. Now I know what is causing them. Glad to read it is not fatal. I am wondering now if sawflies were what decimated my sister’s columbine last year. They came back fine this year. This is an excellent article with good photos. Thanks! Now on to another question…the stems of our yellow columbines have many single, very small greenish yellow eggs that are attached to the stem with a half inch, stiff thread. The thread looks like a white hair. Any ideas? Those are green lacewing eggs. Once they hatch the larvae will eat aphids and other insects. See https://wimastergardener.org/article/green-lacewings/ for more info on these beneficial predatory insects. Thank you so much for the information! I love Columbines and have grown the eastern red columbine from seed for my sisters garden and also to plant in the OSU Extension office garden that the Master Gardener’s of Delaware, OH take care of. Since I planted 2 columbines in the OSU garden, I saw the veining from leaf miners on them and wondered if I really needed to do anything about them. I don’t like pesticides and try to be as organic as possible in any garden, so I appreciate the information saying I can just cut off the leaves. Thanks, again! Wouldn’t you know, my columbines had BOTH these pests this year. The sawflies have disappeared but now the leaf miners are taking over. Just my luck. My native columbines are decimated every year. But they always seem to pop back with a second round of healthy leaves. I will definitely be looking for sawflies next spring! Thanks for the information. My new black Columbines were heavily infested with the leaf miner trails, but not the blue and white. I never knew what was causing the squiggly lines on the leaves of my columbine. I have seen these winding tracks on our columbine plants and did not realize that the insect was actually in the middle of the leaf! This is an excellent article and it has taught me how to try to eliminate the insects overwintering in the soil. I will be sure to keep an eye on the pests now that I know what to look for. It is great to learn of ways to rid my Columbine of these pests without harming other beneficial insects–and to save my flowers!!! I have seen my Columbine eaten down to the stem but it did come back. I will need to watch for the Larvae next year on the underside of the leaves. I lost a couple Columbine and remember them being totally bare of leaves. I just bought 2 more kinds to try again. Now I know what may have been the cause and what to look for. Well, that’s simple. Just plant native columbines. Seems my native are the most heavily infested with both issues, especially the sawfly. I agree that the sawfly eagerly attacks the natives. Guess I need to try spraying with insecticidal soap.